bE: Since your new Best Ears were molded after the exact shape of your ear, it’s likely and common that they’re not being put in correctly. 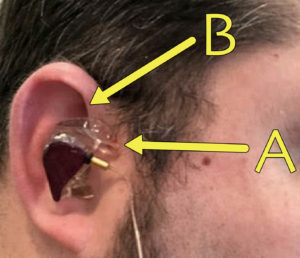 The upper part of the earpiece is designed to go behind your ear’s upper flap, see photo below. bE: Since your inner-ear is flesh, not bone, it has the possibility of expanding or contracting which can affect the seal. For this reason we include one pair of Comply Custom Wraps with every set of our IEMs. The custom wraps are similar to a standard ear-plug material — the type that you press down, insert, and it then expands to the shape of your ear. Some companies offer a silicone type material for their ear canal portions of their IEMs and we’d like to explain why this isn’t optimal. While the silicone style seals well right out of the box, it wears out about every six months and must be replaced by the manufacturer since it is also custom molded. This means a hefty expense on your part and loss of your in-ears for however long the company takes to repair/replace the canal portion. For serious musicians, not having your IEMs for any length of time, is simply not an option. Using Comply Custom Wraps is affordable, simple to do on your own, and only needs replaced once per 4 months or so. A pack of 5 pairs of Comply Custom Wraps is only about $20. CLICK HERE to learn more about them and how to install them properly. bE: Yes. Much like there is no ‘one-size-fits-all’ shoe, everyones ears are drastically different from one another. Custom molding allows for a product that will always fit perfect, feel great, never fall out, and have incredible sound. bE: Almost zero overhead. One employee, small laboratory, no marketing budget, and the desire to make amazing in ear monitors accessible for everyone. Prices will inevitably rise as demand for bE’s products increases, so get it while the getting is good! My recommendation is to use a mini sound board if you’re a musician that isn’t moving around on stage a lot. This method is remarkably affordable and works great (it’s what I personally do for performances). Bluetooth can not work for performance on stage as the latency issues are too severe. Latency is the delay of data when transmitting, it means you would strike a note on your instrument and not hear it in your IEM’s until seconds later. You can however use bluetooth for listening to recorded music, you can pick up bluetooth transmitters/receivers very affordably online. bE: While it is fairly common for musicians to do this, it is not at all a good idea. One of the big advantages to IEMs is the outside sound protection on stage. If one ear is out in a loud environment, you’ll have to turn up your IEM very loud to match.. both dangerous. If your sound/monitor engineer does a good job, you should never need to take one out. Built in 25dB dampening is meant to protect you! bE: A common solution for this issue is to set up one or two microphones facing the crowd that your monitor engineer can bring up in your mix to an appropriate level. This is how big-name acts are able to wear IEM’s and still have crowd participation segments of their show.